Hello everyone!! This is Brenda Noelke from My PaperCut Creations. 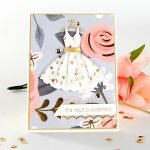 I am excited to be here for my third & final guest post for Spellbinders!! 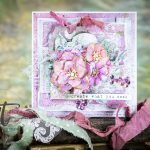 I will be using the fabulous February Die D-Lites Release for all of my projects. You can find my first project here & my second one here. Today, I have two projects to share with you! 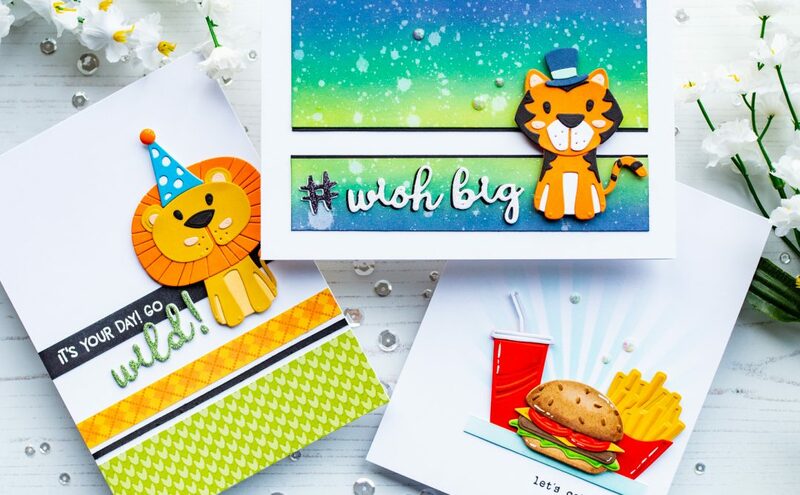 These are cards for kids. Normally, I tend to gravitate toward flowers in my projects, but I like to challenge myself by using different products. My husband & I don’t have any children of our own (just two furbabies), but I do have several nieces. 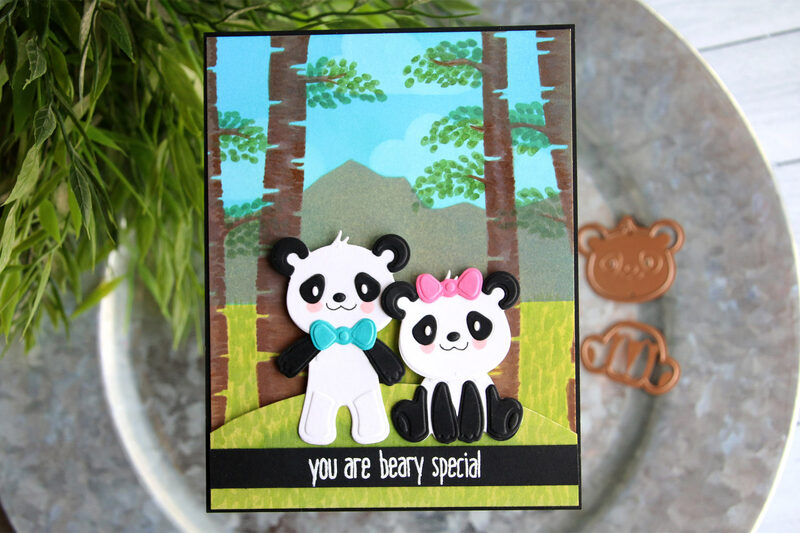 My four year-old niece carries a panda around with her everywhere, so I was excited to see the Build A Panda Etched Dies in this release! 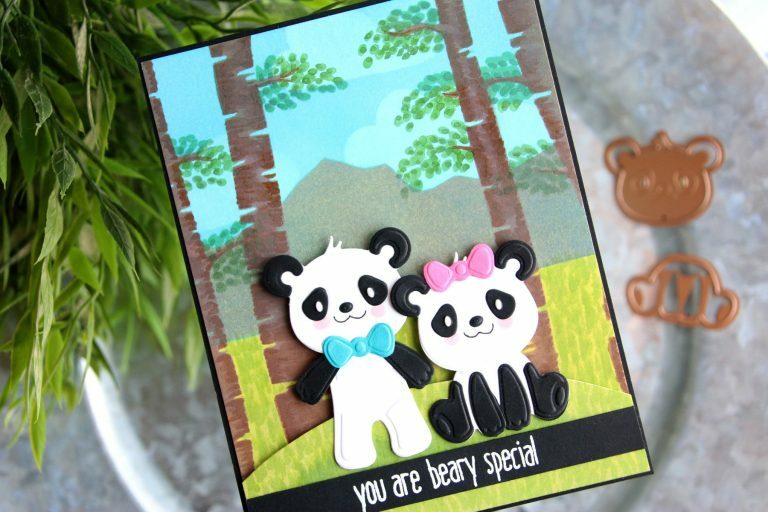 I began by using the Build A Panda Etched Dies to die-cut the shapes from black, white, pink & blue cardstock. 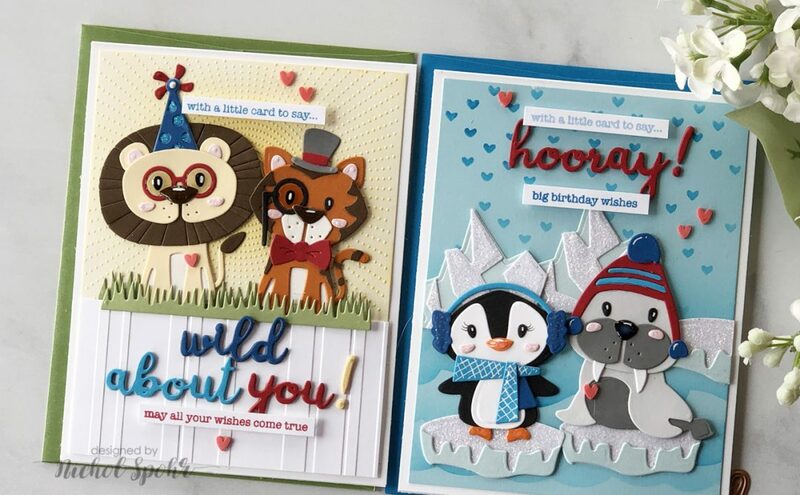 After they were cut, I ran them through the die-cut machine a second time with an Embossing Pad to create the embossed areas on the die-cuts. Next, all the die-cut pieces were assembled and adhered together. 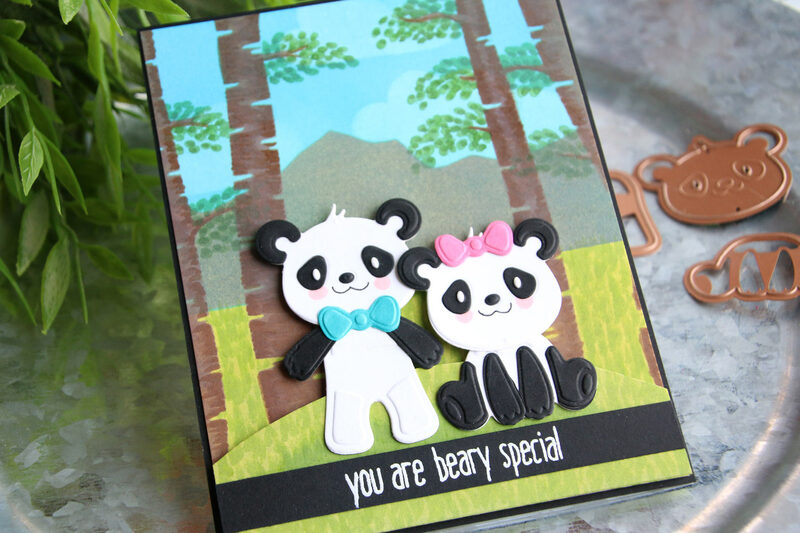 Distress Oxide Inks were blended onto smooth cardstock, using scene builder stencils, to create a background panel for the pandas. I also ink blended and cut a curved piece of cardstock to add some dimension to the bottom of my background panel. I used Copic markers to draw in some additional details on the background, as well as add a little blush on the pandas’ cheeks. The panel was trimmed down slightly to allow a bit of black cardstock to show around the edges. 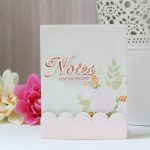 The sentiment was stamped with clear embossing ink and heat embossed with white embossing powder. It was then cut into a strip and adhered toward the bottom of the curved cardstock, trimming on each side. The pandas were adhered onto the curved piece of cardstock, then adhered as one piece with dimensional adhesive. I can’t wait to give this to my niece! I just know she is going to love it! 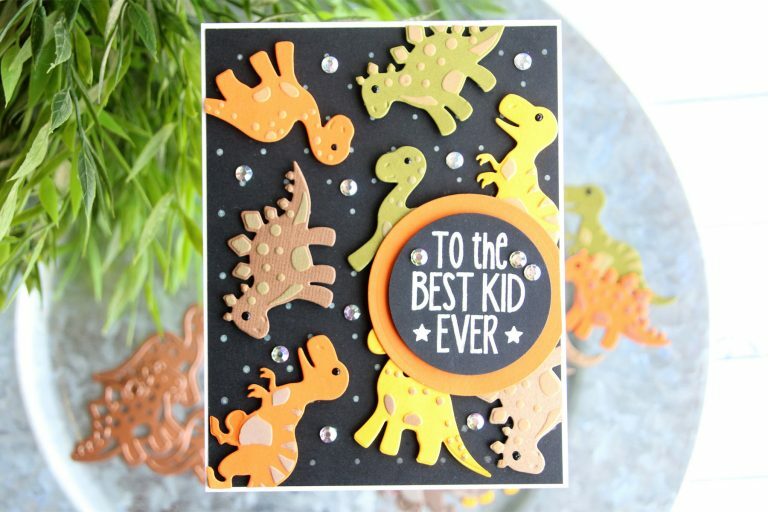 I started off by die-cutting all the Dinosaurs Etched Dies from various colored cardstock several times, then running them back through with the Embossing Pad to create the embossed areas. Before removing the dies, Distress Oxide Inks were blended through the dies, to create some color on the raised areas. I added some black dimensional drops to the eyes, then set them aside to dry. 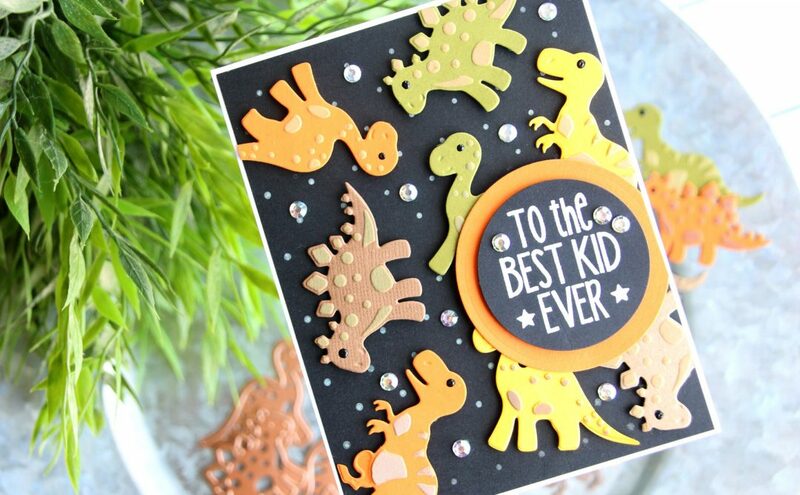 I used the same Distress Oxide Inks with a polka-dot stamp on black cardstock for the background panel. The dinosaurs were popped up with foam adhesive onto the background panel, then trimmed flush where they hung off the edge. 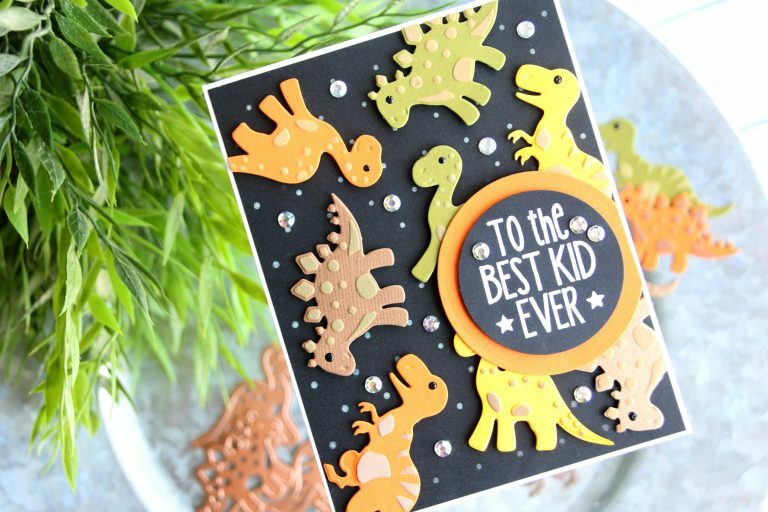 The sentiment was stamped with clear embossing ink onto black cardstock, then heat embossed with white embossing powder. 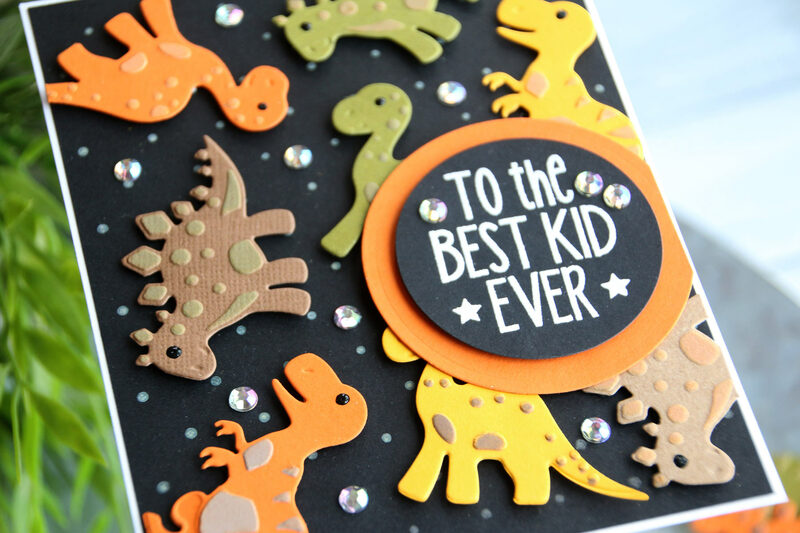 The sentiment, as well as a piece of orange cardstock, was die-cut using the Nestabilities Standard Circle Dies. Both circles were also adhered with foam adhesive and trimmed as shown. Lastly, some rhinestones were added for a little bling! Thanks so much for joining me today! Special thanks to Spellbinders, for having me. 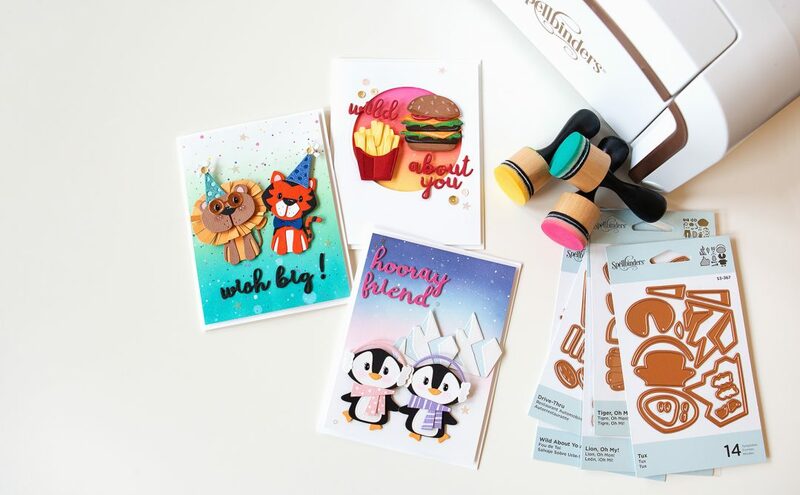 It has been an absolute pleasure to guest post for them and use their fabulous products!